Friday night: Diminishing rain and wind. Temperatures in the 50s. Saturday: Isolated AM showers, then clearing. Early high around 50, then cooling. Sunday: Bright and cool. Highs around 40. The buckets of rain and damaging wind gusts hang on through the evening commute. Then all is relatively calmer overnight and through the weekend. Heavy rainfall continues, tapering off from west to east late tonight. Around an inch of additional rainfall is expected on top of the 1 to 3 inches of rain we have already accumulated. Standing water and ponding on roads will make travel tricky. The wind gusts will continue to be between 40 and 60 mph, relaxing to 20 to 40 mph after 9 p.m.
Waking up to wind gusts from the south 20 to 40 mph and still mild temperatures in the 50s. There will be lingering sprinkles and showers. Our wind direction changes by the afternoon from the west. Temperatures fall all day, reaching the upper 30s by 4 p.m. Saturday. Light snow showers are expected across the higher elevations north and west, otherwise sunshine breaks out. Drier and colder with highs in the low 40s and sunshine. A quick moving system brings us a taste of the season with light snow for the first half of the day on Monday. With temperatures above freezing for most of the day, the snow isn’t expected to stick unless you live in higher terrain. Tuesday it will be mostly sunny with temperatures in the upper 30s. Watching for another round of a wintry mix by the end of the week. 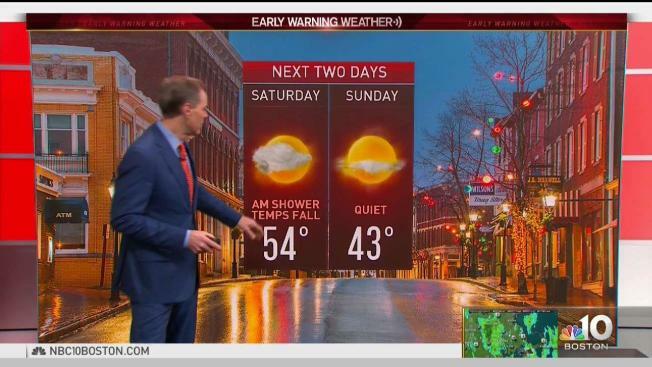 Temperatures stay between 35 and 45 degrees through the following weekend.